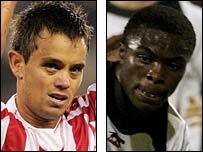 Aston Villa midfielder Lee Hendrie has completed a move back to Stoke City on loan until the end of the season. Hendrie, 29, spent three months at City earlier this season, but returned to Villa at the start of the month. However, despite claims that interest from a Premiership club had scuppered the Potters' hopes of Hendrie returning to them, a deal has now been completed. Also joining on loan for the rest of the campaign is 20-year-old Fulham and DR Congo defender Gabriel Zakuani. "We have agreed everything with Villa with regards to bringing Lee back," said chief executive Tony Scholes. A move to the Britannia Stadium looked in doubt last week when Scholes said: "We were desperate to sign Lee before Saturday but problems occurred due to interest from a Premiership club". However, Villa manager Martin O'Neill has played down claims that Blackburn were interested in a £700,000 bid, adding: "Lee had the opportunity to go back to Stoke at the weekend and it did not materialise - but it has happened now. "I told Lee I couldn't guarantee him a start. I was in no rush to send him out of the door at Villa but would not prevent it from happening if an opportunity came along. "I had no axe to grind with Lee or anyone. "Lee has done well at Stoke and had got his form and fitness back and he wouldn't want to lose that by not being involved a great deal at Villa." Hendrie scored three times in 17 Stoke appearances earlier this campaign, after turning out just once for Villa in the first match of the season. Zakuani joined Fulham from Leyton Orient for an undisclosed fee last summer, but has been restricted to just two cup appearances for Chris Coleman's side.